Cutting the environmental impact across the clothing supply chain and generating value for business through collaboration, measuring and sharing best practice. The European Clothing Action Plan (ECAP) is an exciting project that will bring environmental and economic benefit to the clothing sector. It is the first EU LIFE funded project to address clothing sustainability. Engaging designers & buyers on more sustainable design practices through the Design for Longevity platform. Measuring ‘brand and retailers’ current fibre usage and working with them on strategies to implement more sustainable fibres into their products. Working with apparel manufacturers to make production processes more sustainable, focusing on opportunities to reduce and re-use material waste. 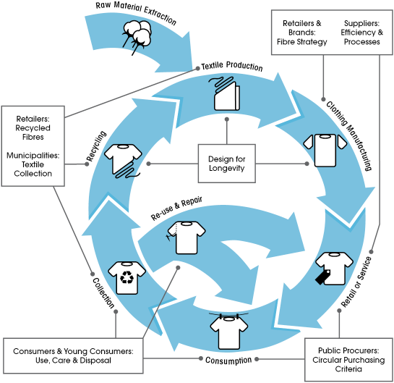 Influencing how European governments procure more sustainable apparel for the public sector. Engaging European consumers to use and dispose of their garments more sustainably. Engaging directly with 16-25-year-old consumers on how to use and dispose of their garments. Working with local municipalities across Europe to improve textile collections. Working with brands and retailers to integrate recycled fibres into their products. Please be aware that we have now extended the ECAP project until 31st December 2019. This will allow us to further develop the project and achieve improved outcomes and insights. It does however mean that the final project report will now be available later than planned at the end of 2019.